Release Day ~ December 1st! Another bullet whizzed through the air and slammed into the bottom of wooden table leg. Needle-like splinters from the wood slashed through her pants and drilled into her thigh like a hundred slivers. The pain knocked the breath from her. The world twisted and turned yellow. Darkness thickened and threatened to overpower her. Can’t pass out…help Mason. 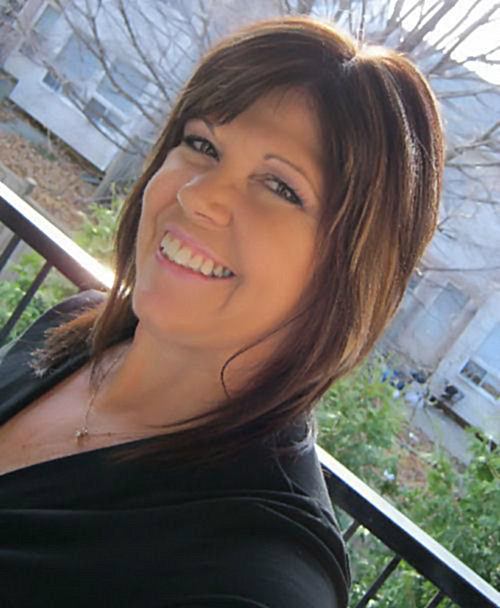 Meet the Author: Kim Cresswell resides in Ontario, Canada and is the bestselling author of the WHITNEY STEEL series. Trained as a legal assistant, Kim has been a story-teller all her life but took many detours including; working in legal and adult education before returning to her first love, writing. Kim recently entered the true crime writing arena. Real Life Evil – A True Crime Quickie (two short stories) was published in January 2014. You can read her latest true crime stories in Serial Killer Quarterly, a new quarterly e-magazine published by Grinning Man Press. She is also a member of The American Investigative Society Of Cold Cases (AISOCC), a non-profit, volunteer based organization of professional investigators whose sole mission is to assist in solving cold cases. Blurb: When ex-SEAL Nate Wolfe learns a woman from his past is in danger, nothing will stop him from protecting her. Not even her. Blurb: Some secrets are better left dead. Too bad the Angel Killer’s digging them up. Blurb: Tara Jacobs had her life completely planned. She truly did have it all after a lifetime of struggles. Unfortunately, her stepbrother arrives in town and threatens to ruin her well-laid plans with some blackmail. Tara stops at almost nothing to keep her skeletons from tumbling out of the closet. Blurb: Are rules really meant to be broken? Jake Carrington finds out the hard way and the answer is no! Dating Chloe Wagner was a huge mistake, and Jake should have known better—he’s investigating the murder of Chloe’s sister. Now Chloe is the number one suspect in that murder. If she’s convicted, Jake could lose not only his rank, but his career. If that’s not bad enough, he’s got a stalker on his hands, someone who’s threatening his fledgling relationship with the lovely Mia. Things are getting just a little too personal for comfort! 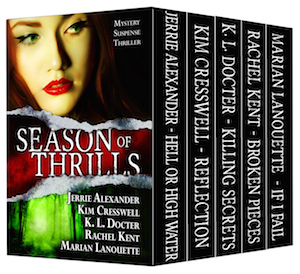 SEASON OF THRILLS Box Set is a value-packed, thrill ride for those who love romantic suspense, procedural suspense, detective mysteries, thrillers, and so much more! Get all five, full-length novels for one low price NOW! 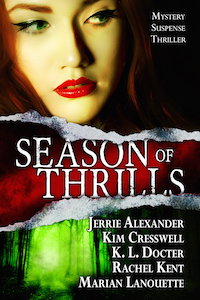 This entry was posted in **Author Peek**, **Book Peek**, Karen's Killer BOOK BENCH. Bookmark the permalink.